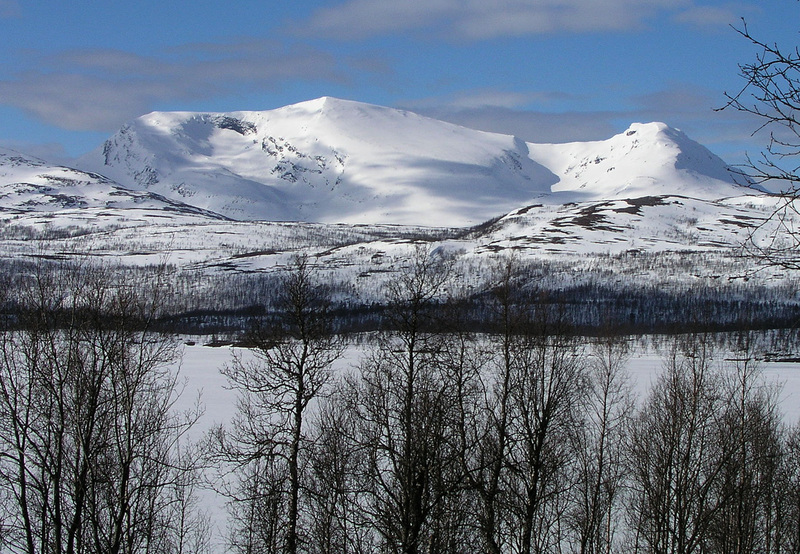 How to get there: Access to this peak is best from the north side near Takvatnet, (215m). From Tromsø, head south along Hwy. E8 to Nordkjosbotn, this is 71 kilometer. From Nordkjosbotn, take Hwy. E6 south, after 28 kilometer you are close to the lake Takvatnet. Continue along Hwy. E6 for about 9 kilometer, look for a road that goes left and has a sign saying "Kallbekken". Turn onto this road, cross the bridge, turn left where the road forks and drive 1.6 kilometer measured from Hwy. E6 to the farm Lillevoll. Ask permission to park there. This is a good trailhead. The precise loctaion is north 69:06.323, east 018:54.749, elevation 171 meter. I stayed at Vollan Gjestestue in Nordkjosbotn, phone (+47)77722300, the night before, since coming from the north. This is quite a nice place with reasonable rates (NOK 695 for a night). Route description: From the end of the road, head out west (a very short section) along the trail that has been established by the farm. Very soon, this trail curves right and heads uphill through the forest. The route will take you near a small cabin owned by the Lillevoll farm, then continue uphill and exit from the birch forest near location north 69:05.007, east 018:56.386, elevation about 550 meter. 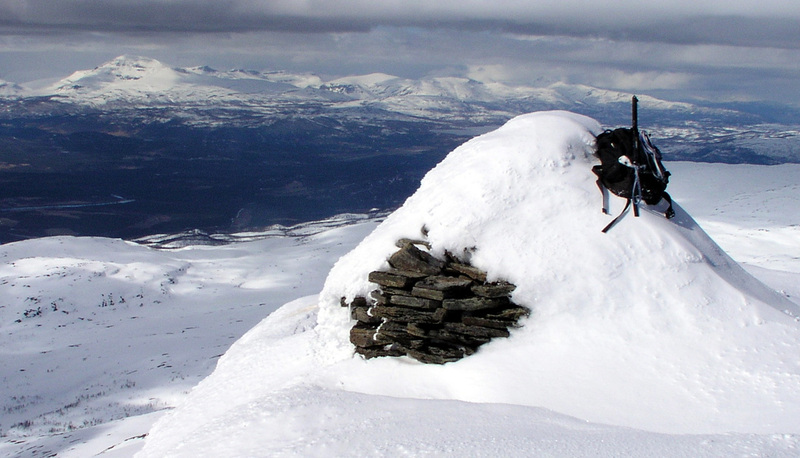 From here, do an ascending traverse to the area just north of lake 796 between Mauktippen (1151m) and Stormauken. The steepest part of the route is next, ascend east and south (a few zig-zag moves) to attain the more gentle slope about 100 meter higher. Continue ascending south aiming for a point on the ridge well to the west (right) of the Stormauken summit. Attain the ridge and follow it to the summit. The distance one way is about 5.3 kilometer. Comments: I did this climb solo. It was a nice day with blue sky and only weak wind. I talked to the Lillevoll farmer and he adviced me where to park my car. The day was just beautiful as I set out up the hill. Upon reaching the summit, more clouds started accumulating in the south and west, but the view was still very nice. I had a good ski downhill and then a nice chat with Lillevoll and his wife when passing their cabin. The nice weather had convinced them to schedule their lunch up there. They told that they had been watching part of my ascent as well as descent from their veranda. I had started out at 0815, made the summit at 1045, so 2.5 hours. 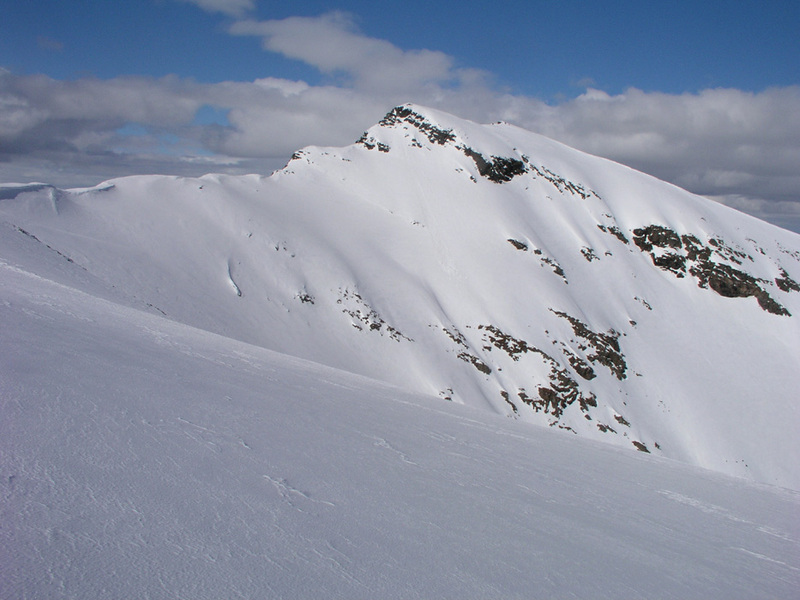 After spending 15 minutes at the summit, I skied back down in one hour including the chat with Lillevoll, thus arriving at the car at 1200 noon. By the time I was back at my car the weather sky was completely covered by clouds. This was high prominence peak number 11 in my T5 trip. Next peak Sætertind. Previous peak Blåtinden. Road scenery. After leaving Nordkjosbotn, early in the morning. What a nice day in Troms. The picture is north across Ballsfjorden. View north. This picture is taken just above treeline at elevation 548 meter, location north 69:05.007, east 018:56.386. Mauktippen, 1151m, connected by a saddle north-west. Leirtinden, as seen from Stormauken. View south. This picture is taken from the summit.